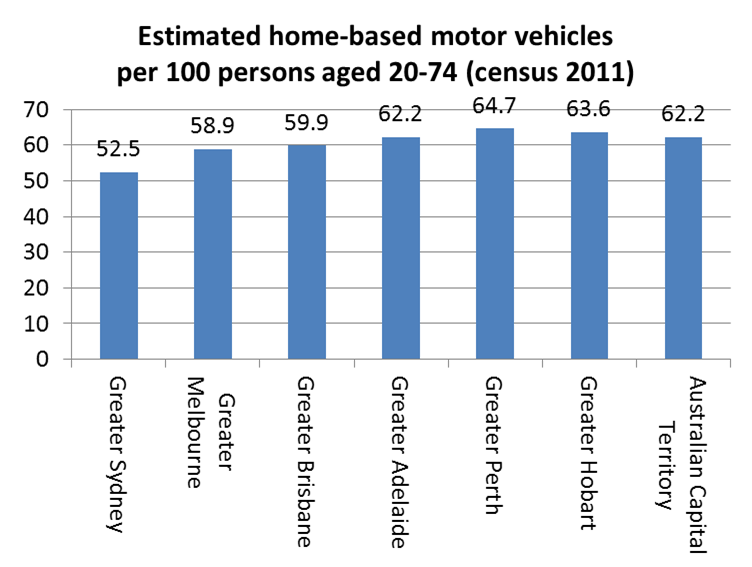 This entry was posted on Friday, October 19th, 2012 at 4:38 pm and is filed under Australian Cities, Car ownership, Mode share, Urban density, Urban Planning. You can follow any responses to this entry through the RSS 2.0 feed. You can leave a response, or trackback from your own site. Great post. Absolutely loved it. On your last point about measuring transport supple, perhaps you could use the value of the government subsidy for operating costs to public transport per passenger km? That strips out any increase in supply that either creates its own demand (via increased frequency and capacity) while also taking into account the benefits to public transport of higher densities. It does have the disadvantage of depending on how well that city keeps its PT operating costs down, but otherwise could be a suitable proxy for PT supply. It would also be interesting to see the same maps with overlays of commuter rail lines & tram routes. There’ll be chicken and egg relationship in some areas (i.e. did the density follow rail or precede it?). 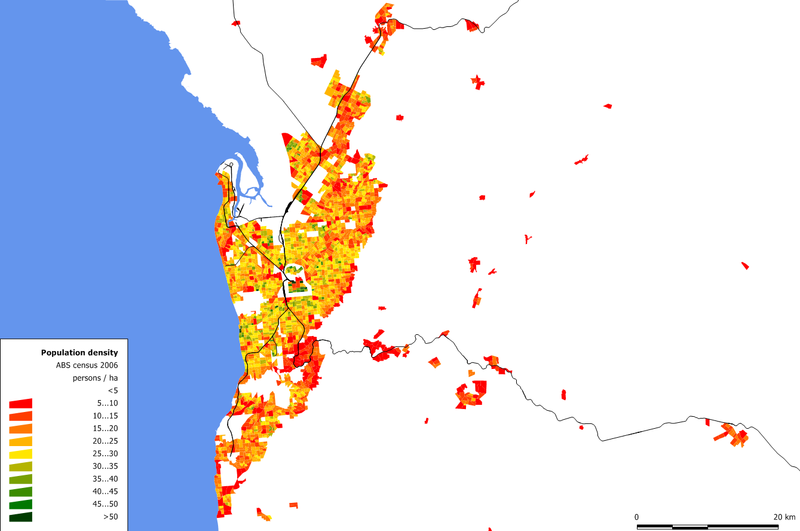 However, it would highlight the parts of Australian cities that have developed high densities in their absence. Thanks for the suggestion. After a lot of searching the web for free data, I’ve been able to add railways to the maps (unfortunately it is not easy to only show passenger lines). Hi Chris, a great collection of graphics. 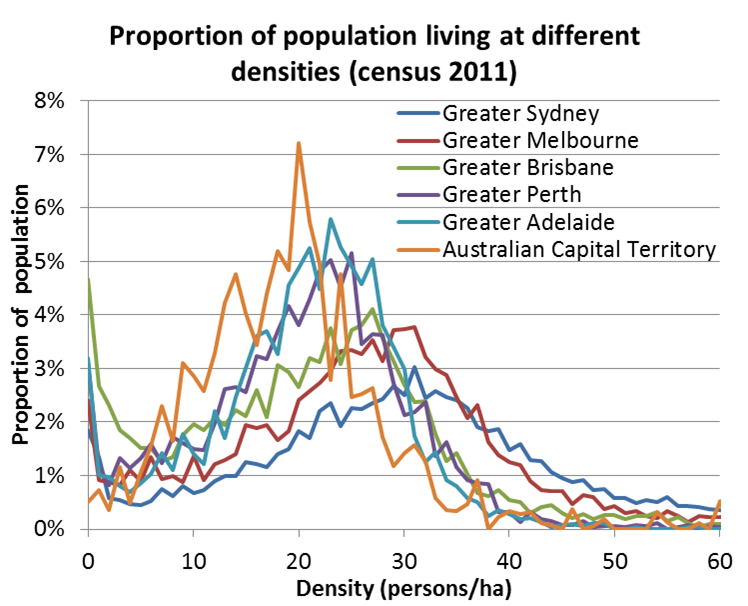 On the melbourne which omits the less than five density rating it very clear. It would be could to have one that shows biycle access to rail as 3km dia overlap. Love to see the numbers for that my bike rail map 1992 version could with and update. Can I have your permission to use your base map to do that . Last time we met In Mornington I noticed your stuff on Dutch Bike rail access. See my Website and last paper of mine on it. I provides data on electric bike access in the Netherlands. 600,000 sold in the last 6 years mostly to elderly people. Great post. A major factor in Sydney’s high PT use is a high proportion of journey to work trips to the CBD and major centres being on public transport. Trying to find a link to this but one theory for this is the very high cost of private parking in Sydney’s CBD and major centres (as opposed to quality of PT). US and Canadian cities use Census Tracts as their main unit for statistics, which have about 5000 people each, and as a result often include lots of non residential land like parks and employment, bringing down density. The last page has all the weighted densities (US+Canada), plus my attempt to estimate the adjusted Australian weighted densities. 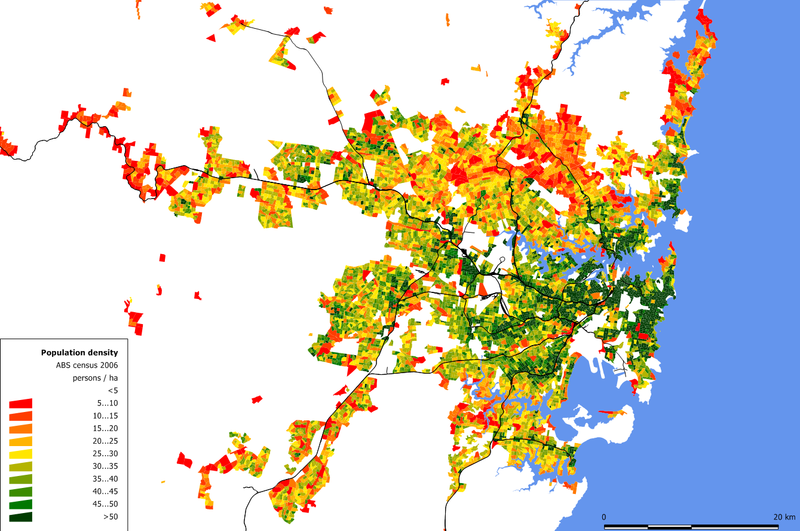 Urban Areas as defined by the US Census Bureau are basically the contiguous developed areas of a Metropolitan Area with densities of 1.93people/ha or more. They also include areas with that density in close proximity to the main urbanized area but separated by a bit of rural/low density land (the exact rules are a bit complicated). Canadian Urban Area weighted densities were calculated using the same methodology as US Urban Areas. 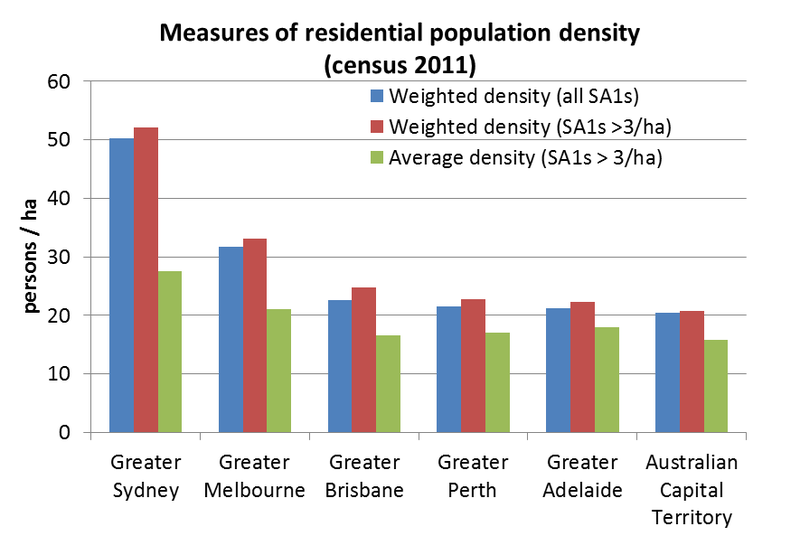 Do you think you could calculate the Australian weighted densities using something roughly the size of census tracts? Or alternatively using something like SA1s for Canadian/US Metro Areas (instead of urban areas), Canada has dissemination areas which are about the size of SA1s but I’m not sure how to download the data. It seems like Canadian cities are denser than Australian ones, but it’s hard to say how US cities compare to Australian ones. The Australian geography has SA1s at about 400 people each, and SA2s at about 10,000 people each. So unfortunately there is no established geography that averages around 5000 persons. Someone would have to manually create a new geography aggregating SA1s, which would be a lot of work. Alternatively, someone could aggregate US/Canadian census tracts to make them roughly 10,000 in size, and calculated a population weighted density using those. The second option is probably more achievable, but does anyone want to volunteer? Sorry, I haven’t really got time to try to download Canadian dissemination areas at the moment (I have a backlog of Australian 2011 census data to analyse!). I just aggregated them for Canadian cities by sorting them by census tract number and combining like that. For example, Tract 1+Tract 2 = Aggregated Tract 1.5, Tract 2+3=Aggr Tract 2.5, Tract 3+4 = Aggr Tract 3.5. This is not perfect, mostly sometimes the tracts aren’t adjacent, but a good majority of the time, they are. The new weighted densities are about the same, relative to each other as when looking at non-aggregated census tracts. 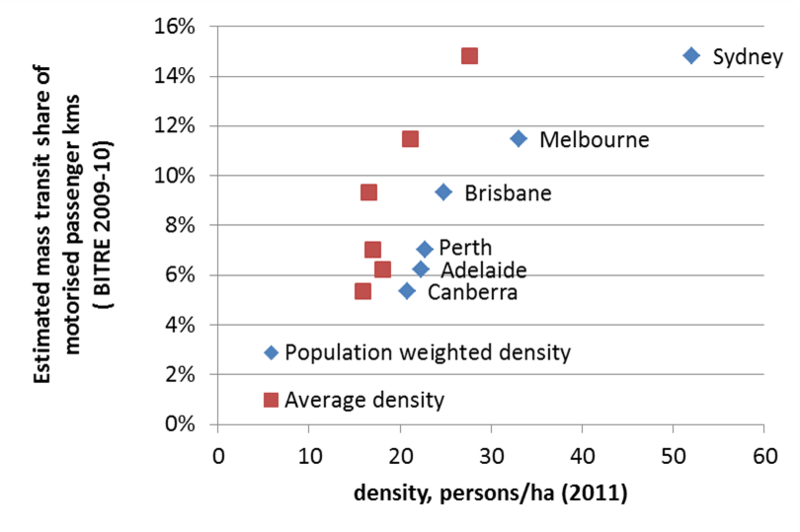 Here are the densities in inhabitants per hectare for Canadian urban areas. By the way, I suspect if you looked at disseminations for some Canadian cities, especially Toronto, the weighted density would jump up a lot. Much of Toronto’s density consists of small highrise clusters surrounded by single family homes (or non-residential uses in downtown areas), as well as large parklands and low density employment areas that bring down the density of many census tracts. I looked at a sample of about 50 tracts to see how the weighted density changed if you look at dissemination areas, based on that, it looks like the weighted density by dissemination area for Toronto might be around 100inh/ha. *Canberra = Australian Capital Territory. The SA2 based weighted densities are much lower (as you would expect), and the ratio between the SA1 and SA2 weighted population densities range between 1.38 and 1.79, which is a fair amount. 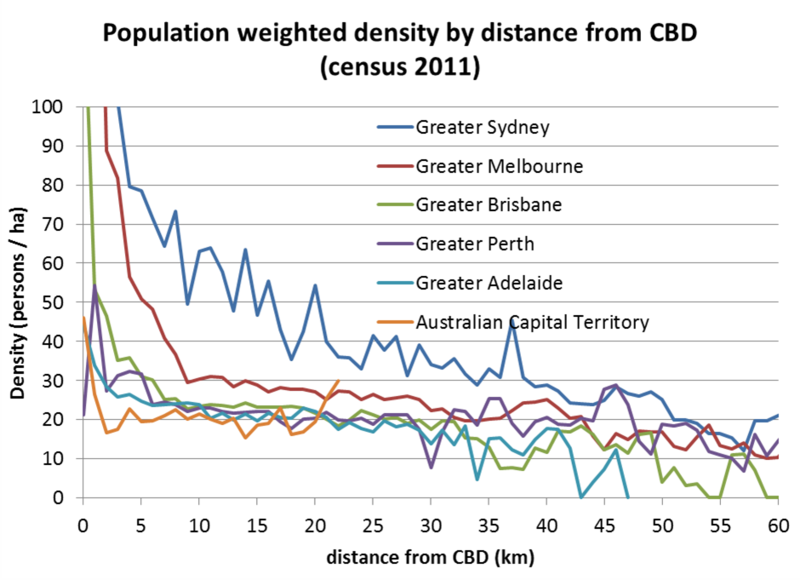 However Sydney is still the densest, followed by Melbourne, then Perth, Brisbane, Adelaide and Canberra are still much the same. How big are the Canadian dissemination areas? Dissemination Areas typically have 400-700 people according to StatsCan. Also when I aggregated the census tracts, they turned out to be more around 9000 people (so 4500 per CT), but I think this should still be relatively comparable to Australian cities. The main thing that might have to be tweaked is the way the regions as a whole are defined. 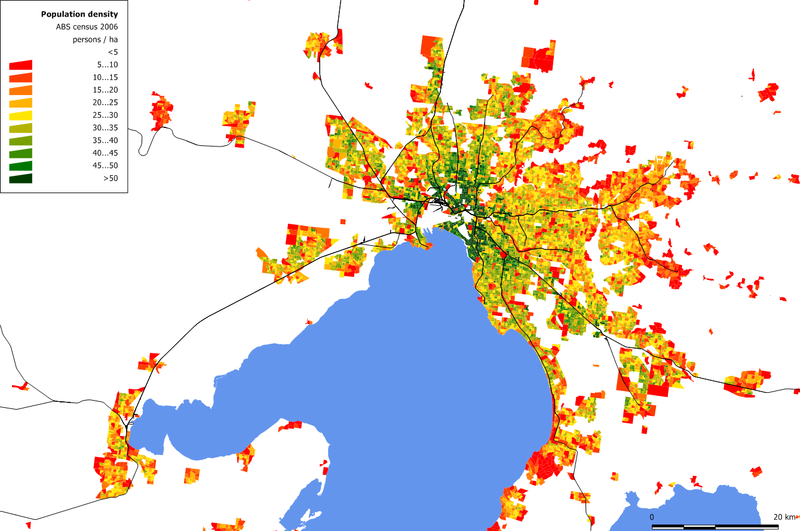 The Canadian urban areas don’t include areas significantly separated from the urban area by rural land, so for example, Geelong wouldn’t be considered part of Melbourne’s urban area. I did however include census tracts with rural (<193ppl/km2) densities if the census tract contained denser areas near the main urban area. Census tracts with no population or low densities surrounded by denser census tracts, like industrial areas or large parks were also included. There's also a few tricky cases where the land between two separate metropolitan areas might be urbanized, so they could be considered a single urban area, but are separated because they are separate metro areas. In Canada, you see this with Toronto, Oshawa and Hamilton. This is also common in the United States, with San Jose and San Francisco; Los Angeles and Riverside-San Bernardino; Washington and Baltimore and New York and Philadelphia. The weighted density for many Canadian cities would probably drop by about 10% if I include the whole metropolitan area and not just the urban area. That would take a while, but I can do that, especially since it would also allow me to compare to US cities, since 2010 data is only available for metro areas, for urban areas, the US Census Bureau currently only has 2000 data. The US only seems to have census block groups between census tracts and census blocks (city blocks), which are a bit too big at about 1500 people each. Here are the weighted densities for aggregated census tracts, same as above, but for metropolitan areas instead of urban areas. Some cities had relatively significant decreases when comparing metropolitan areas to urban areas, either because they included a lot of rural or very low density exurban areas (Ottawa, Halifax), or a lot of commuter towns (London, Edmonton, Montreal, Toronto). 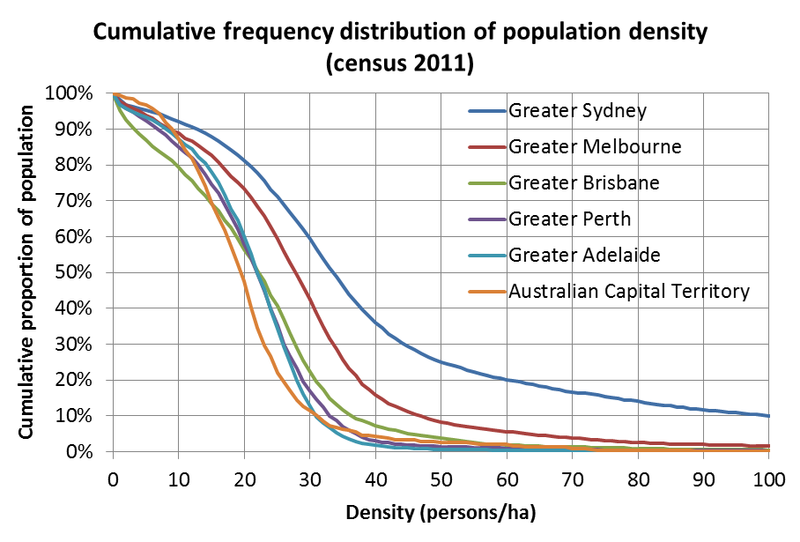 It would be interesting to see the geographic distribution of Employment density (workplaces). 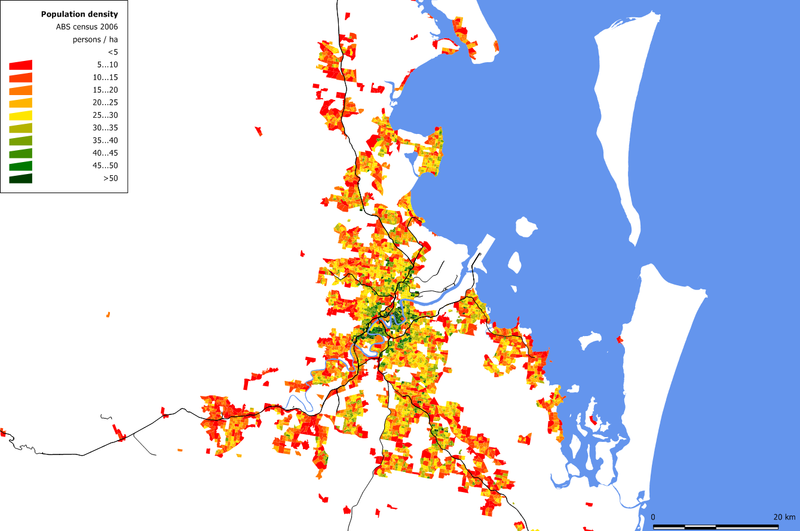 To some approximation, the difference between Residential locations and Employment locations would be indicative of the demand for transport. 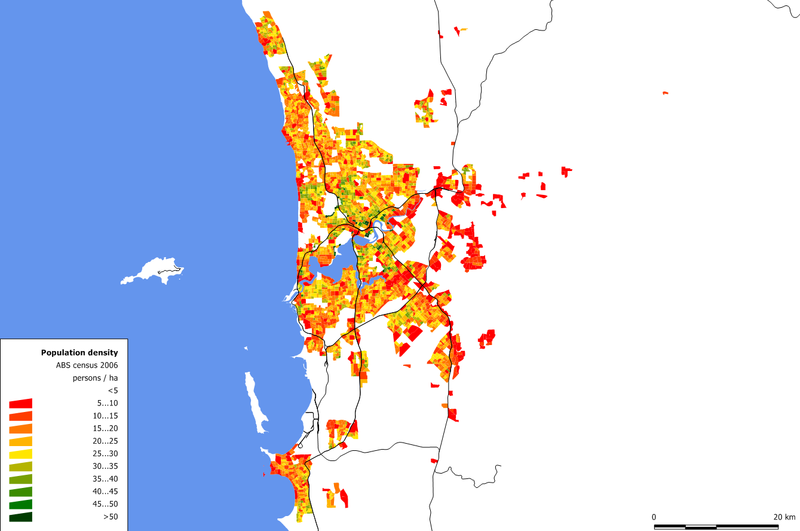 In the case of Adelaide where I live, the public transport system is CBD-centric radial, but I suspect that CBD-based employment is now a minority. Understanding of the distance and direction that people commute would be very helpful in transport planning.